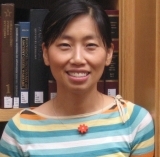 ShinJoung Yeo is a PhD student and Information in Society fellow at University of Illinois at Urbana Champaign. She is also a founding member of Radical Reference, a collective of volunteer library workers who use their professional skills to answer information needs from the general public, independent journalists, and activists. She was named 2005 Library Journal Mover & Shaker with her husband James Jacobs. She holds both a bachelors (1999) and masters (2002) degree in Journalism and Communications from the University of Oregon. She previously worked as a reference librarian at the University of California at San Diego and the San Diego Community College District Libraries, and as a news reporter for Korean-American Television in Los Angeles. In September of 2007 she and James Jacobs took the Internet Archive's Bookmobile on a tour of Northern California, bringing a demonstration of print-on-demand services to communities that do not have easy access to a wide variety of printed materials.